When my oldest three children were very young I kept a blog documenting the in’s and out’s of our days. 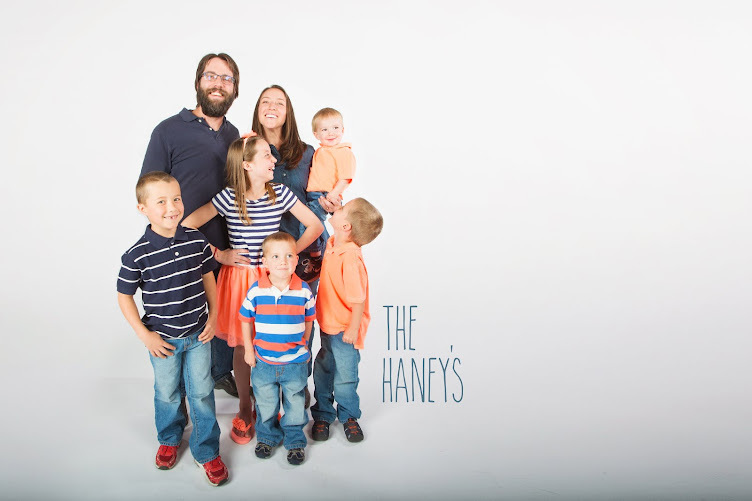 After blogging for a few years I took that blog and turned it into a book that I titled Haney Heritage. Today, my children found the book on the shelf and all three of them had a wonderful time mulling through the pages of our family’s history. So tonight I decided to bring Haney Heritage back to life. There are many undocumented years, and countless untold stories that I will not be able to remember. If I’m able to come up with memories of these events, I will try to pen them here. I’m sure this space will also house my ramblings, theology, and rants. This week has been so much fun! Sunday, April 1 was Easter and April Fools’ Day. If you read my last blog, you know this Easter was a very significant day for my husband and I this year. I wanted to come up with a great prank to play on my kids, but I guess I just didn’t get my act together in time. Also, I didn’t want to hurt any of their feelings, so that probably worked out for the best. Saturday night our family made our first attempt at having a Passover Feast. We cooked lamb, a boiled egg, bitter herbs, and that dish with the apples, nuts, and raisins. Luke did a wonderful job of leading the ceremony. He would explain the way the Jews did the passover, and then he would explain how these things are significant to Christians today. I really enjoyed the whole thing. Easter Sunday was the 5 year anniversary of the day Lucas fell in love with Jesus. What a wonderful wonderful day! Luke and Mandie worked all three services at church, and Matthew tagged along with them. They left the house around 6:30 AM that morning and finished at 1:30 in the afternoon. After church we had an Easter meal with our dear friends. I brought my grandmother’s famous Coke Salad and it was a hit! They have three bunnies, and the female had a litter of kittens two weeks ago. Michael especially enjoyed those bunnies. In fact, that morning he had been telling me that Rosie had bunnies and we really, really needed to go to their house to see those bunnies. He was ecstatic and surprised when I told him we were going that day! They also have chickens, and yesterday they added two little piglets to the farm. They encouraged us that we can handle some animals out at our place as well. Easter was a joy! The next two days of this week were just regular school days. We woke up, did our morning routines and our chores, then we completed full school days. On Tuesday we did all the Easter stuff that we didn’t have time to do on Sunday. We did the Easter baskets. All the the kids got a zippered pencil bag,they loved those things, and they also received some candy and other little tokens of our affection. We hunted Easter Eggs. This was so fun, because Mandie and Matthew got to stuff and hide the eggs. Everyone was assigned an egg color, and the older kids’ eggs were hidden hardest, the youngest kids’ eggs were just right on the open ground. It worked out great! Marcus and Michael were so excited every time they found an egg! Melodie did not hunt eggs, but she did enjoy shaking them and watching her siblings as they hunted! On Tuesday night at dinner I asked the kids if they felt the Lord was trying to say anything to them or to our family as a whole. Mandie said something very profound. She basically said that she was glad we didn’t do any of the regular ‘Easter stuff’ on Easter Sunday, because God used that to show her that Easter is really not about that stuff at all, even thought that stuff is fun. Easter is about God’s Love for us, and it’s about spending time celebrating that with friends and family. Thank you, Lord, for speaking to that girl’s heart! Silly Rabbit, Easter’s for Jesus!! Wednesday was Miles’ FOURTH birthday! His birthday is 4-4-14, and he turned 4 years old that day. I can’t believe my little Miles is so big! Oh I love him so! He wanted hot dogs, orange plates, orange balloons, and lots of dragon stuff for his party. And that’s what he got! Mimi and G-Dude got him a remote control dragon toy. Luke and I got him a dragon costume. Aunt LaJean got him the Dragon’s Love Tacos books and toy. Nana and Poppy got him a play set for outside. Everyone will enjoy that! The kids spent the rest of the day playing the Wii and playing outside. Much celebrating was done by all. Thank you, God, for Miles. Thursday we had a play date with some new friend’s in town. These people are AMAZING! They have four kids of their own and they foster special needs kids who are put into the foster system. One of these sweeties they have adopted, she is now 4. We thoroughly enjoy our time with them! Last week we went to the Albuquerque zoo with them and I am so grateful for this friendship! Matthew and their son spent the entire time playing basketball. Much fun was had by all! Later that day we had our monthly homeschool group up at church. I feel so grateful for my homeschool community, what a blessing! Yesterday that same homeschool group had a field trip to the Albuquerque Aquarium and Botanical Garden. They call that area the Bio Park. We were there for about four hours, a good field trip. After the field trip, I dropped Mandie at church to decorate for the Father Daughter Tea they enjoyed this morning. Luke picked her up on his way home from work. Last night we had Family Fun Night. Dinner was tasty, thank you InstaPot! Our movie was Ferdinand, it was a bucket of laughs I tell you! Today we worked. Hard! There is this amazing spot on our property that looks like sand, but just under the sand is like 8 inches of gorgeous topsoil! I shoveled about 12 wheelbarrows of that stuff into my new veggie bed, it won’t be long before it’s time to plant! Thank you, Lord, for helping find that great dirt! Also, there is this neat woman who lives down the road who took Mandie horse back riding with her the other day. She has a friend looking for a place to house her old horse, Cholla (pronounced Choi-ya). Cholla is well trained and loves to be ridden, but the owner does not have the time to ride her now, and she wants her to be with someone who will ride her and give her the attention she needs. Our friend thought Mandie would be the perfect person for Choya, and Cholla would be the perfect ‘learning horse’ for Mandie. So we spent some time cleaning out the horse barn and the area around it in preparation for this horse. We probably are about a third of the way done in there, LOTS of work! Luke, Matthew, Michael, and Marcus got out the BB guns, bows, and arrows and did some shooting. MelBel was here, there, and everywhere. All in all, a wonderful day! Oh Lord, when I take the time to write it all down, I can see how blessed we are. Thank you Father. Life is so good when we live and play by your rules! Help us to be who you want us to be. We love you, Father. Amen.